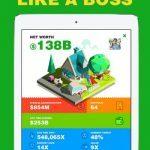 Idle Payday: Fast Money is a new simulation game from Kongregate, a company that’s responsible for some highly successful mobile games such as AdVenture Capitalist and AdVenture Communist to name a few. Whether you wish to admit or not – everyone had their share of dreams of obtaining a massive fortune, i.e. of having a suitcase full of Benjamins. Unfortunately, the real life is pretty cruel on an average guy, and only the rare ones get to enjoy the luxury of private jets, villas, fancy restaurants, etc. Luckily, Idle Payday: Fast Money will take you on a journey in which you will spend days throwing away your wads of cash like there is no tomorrow! We have prepared the best tips and tricks for everyone willing to try out this addictive and captivating game. Our 9-point list of tricks, cheats, and tactics will make you a billionaire in a blink of an eye, and that is why you should stick with this Idle Payday: Fast Money guide. The gameplay of Idle Payday: Fast Money is quite simple, and novice players will quickly realize that a lot of action in this simulation game can go on without you. In other words, your faithful workers are never tired and they will keep bringing money your way, even when you are not playing the game. Also, your business will continue to run independently, and when you return – your only task is to reap the rewards. However, some things need to be done manually, and that is why you need to briefly visit the game as often as possible. For instance, the process of upgrading your character requires a manual tap, which means that you cannot progress to higher levels of cash flow unless you level up your character. Once you reach a certain amount of profits, you are free to progress to the next level. The fact that you need to unlock the new levels manually may seem tedious, but the actual process is super-easy and you just need to tap once to move up the ladder. That is why we recommend that you visit the game every once in a while because this can boost your progress and make you grow your wealth even faster. Every modern-day billionaire would tell you that investing in real estate is the way to go! Of course, you should always be cautious when depositing your money, and not every real estate property will bring you the same turnover. However, Idle Payday: Fast Money allows you to sign contracts in a flash and to open the doors of your business in no time. Consequently, the visitors and customers will start pouring in, thus bringing more cash to your treasury. Idle Payday: Fast Money offers an abundance of options when it comes to buying buildings and companies. Depending on the type of character you select – you can either buy real estate with a more urban feel to them or you can own businesses that feature a country style. 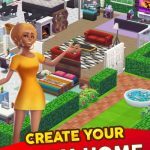 Either way, 10 types of buildings will be at your disposal, and they will be ranked on the basis of their overall worth. Gas stations and diners are the lowest on the price ladder, but if you play the game right – you will soon gain access to high-revenue properties such as fancy clubs, galleries, gourmet restaurants, or even luxury airlines! Every one of these buildings will yield profits, and your job will be to sit back and enjoy counting your money. Since you do not have to pay taxes or interest rates on the properties you own – why not obtain as many of them as you can?! However, Idle Payday: Fast Money lets you invest in “only” ten categories of businesses, and inexperienced players could be disappointed by these limitations. Luckily for them, there are ways for boosting the payouts, and your best course of action is to boost the ranks of your buildings. Once your business reaches a higher level – the yield it generates will rise as well, and this will result in better liquidity of your character. The process of increasing the ranks of your buildings is pretty straightforward, and you only need to click the button on the top right corner several times. Every click will change the number of buildings you can buy, but eventually, you will reach the option called “Rank up”. By using this feature, your business can be quickly and efficiently expanded. In other words, you will avoid the need to click on respective building dozens of times just to bring it to the desired level. Of course, you will need to have available funds in your account in order to rank up the business since nothing in the world of Idle Payday: Fast Money comes free of charge. Another tip which we can usually find in those books that give advice on how to become a millionaire is the fact that social connections are a crucial element of money-making. As we all know, friendships and other similar relationships can do wonders for acquiring a fortune, and if you want to find your bonanza when playing Idle Payday: Fast Money– join the Events section as much as possible! Events are a special feature within Idle Payday: Fast Money, and these mini-games take you away from the main business and let you interact with other people and grow your Prestige and Reputation in a convenient manner. By participating in those Events, you will have access to the same types of business for investments as usual, but your character will receive additional options for improvement. If you spend your cash wisely, you can buy crucial upgrades and equip your character with much-needed items. Rising through the ranks will be much easier if you regularly use the command on the right-hand side of your character, and that is why you should never miss the opportunity to gather some bucks during the Events. Earning money and spending it is equally fast in Idle Payday: Fast Money, and you will quickly become addicted to purchasing more and more business in order to pile up more and more dollars. It’s a vicious cycle, and it is hard to resist the lure of attractive banknotes once you taste the power of money. However, we urge the players to take a breather every once a while and to invest their funds in some other channels except for buying new buildings all the time. One of the best ways of spending your cash is to buy upgrades and improvements. Idle Payday: Fast Money offers a plethora of options when it comes to boosting your moneymaking performances. Upgrades will significantly help in generating more profits, and this consequently leads to easier access to higher levels of the game. Another cool thing about these upgrades is that they are permanent, i.e. they do not disappear once have to start all over again and build your fortune from scratch, which will happen every once in a while when playing Idle Payday: Fast Money. As we just mentioned, Idle Payday: Fast Money allows you to start all over again frequently, and this is not a bad thing despite what you may think. In other words, starting over means that you reached a new level and that the Reputation category you own exceeded the limitations of the previous chapter. Of course, we all know that Reputation and Prestige are a highly valued commodity in the corporate world, and that is why it is advisable to collect as many of these points as you can. There are several ways by which you can boost your Reputation levels, but the most obvious method is to earn more money! Your earnings and overall prosperity play a crucial role in the process of gaining Prestige points, and the more affluent you are – the more Prestige you will acquire. By entering the Prestige mode, all of your businesses get restored to their initial level, and this is why you need to perfectly time the use of this option. If you use it too soon – your hard work will go down the drain, but if you keep waiting for too long – your progress to the next level will take longer and longer to achieve. Modern-day businesses rely heavily on automation, and ever since the beginning of humanity – we always tried to find ways that would make our work easier. 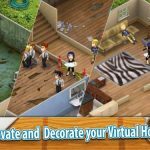 The same goes for Idle Payday: Fast Money and this simulation gives you the ability to accumulate lucrative profits, even when you are busy doing other things than playing games on your Android device. What we mean by automation in this particular game is the convenient option of hiring workers to the job for you. In other words, a mini-army of hard-working laborers can hoard the cash and boost your income in an easy and hassle-free manner. During gameplay, Idle Payday: Fast Money allows you to earn money by „tapping“ on your character. For every tap – a certain amount of cash goes into the bank. By implementing various upgrades, the rewards for each tap can be more and more generous. However, we advise beginner players to purchase workers early on in the game, and these guys will independently do a tap every couple of seconds. The number of available workers is displayed in the upper right corner, and the more of them you deploy – the better the cash flow! Aside from the dollars and the gold coins, Idle Payday: Fast Money lets you collect some other things as well. For example, resources such as bolts, wires, and power cells are of great importance since they can propel your progress and make your funds grow exponentially. Furthermore, these resources are used for opening the Event Prize Box, and the more power cells you own – the more rewards you will be able to collect! Of course, bolts and wires will not be in your focus at all times because money can make you forget about everything else. However, we suggest that you keep an eye on the resources and that you are never idle when it comes to collecting them, no matter what the name of the game says. Just like having a diverse portfolio of buildings brings lucrative rewards – the same goes for having a range of options in your storage. Admittedly, dollar bills make the world go round, but you can make the planet spin much faster if you engage a few power cells in the whole process. Also, gathering resources will add to your Reputation points, and you will level up faster if your employees generate a lot of bolts. As we already mentioned, several types of resources are available when playing Idle Payday Fast Money. Bolts, wires, and power cells allow you to buy all sorts of upgrades, and that is why it is important to collect as many of them as possible. However, your laborers are trained in generating only one type of resources, i.e. the bolts. Unfortunately, the upgrades you want to purchase will sometimes require power cells or wires, and this means that you will be forced to exchange one type for the other. Luckily, the exchange process is fast and efficient, and you just need to click on the symbol with two opposing arrows on the left-hand side of your character. Once the players enter the exchange section, they will be able to adjust the number of units they want to trade. The easiest way is to set up the number to “Max”, and this will bring the most out of the exchange process. Once you gather enough power cells, you can buy upgrades or try your luck with the Event Prize Box. Every pull will present you with a gift, but some of them can be more rewarding than others. This tip wraps up our list of Idle Payday: Fast Money tips, cheats and strategies, and we sincerely hope that this in-depth guide will allow you to cruise through the game and collect loads of cash with ease. If you know of any other helpful Idle Payday: Fast Money tips or tricks – do not hesitate to leave a comment below!